The Toronto Maple Leafs, after losing both their composure and Game 2 in Boston, came back to beat the Boston Bruins by a score of 3-2 in Game 3. I believe that Game 3 is a mirror to how the Maple Leafs can win this series. The Maple Leafs now lead the series two games to one, and they have home-ice advantage. In the NHL, home-ice advantage is important for three reasons. First, a rabid home crowd can create a huge source of energy during games, especially later in a game. Such energy is motivating. Second, many players simply play better at home than they do on the road. It’s more comfortable, one’s routine isn’t interrupted, etc. But these two points are also true in other professional sports like NFL football, NBA basketball, and even in MLB baseball. There’s a third reason home ice advantage gives an NHL team a distinct advantage. That reason is that the head coach of the home team has the last change. Specifically, in Toronto, coach Mike Babcock can see which players Bruins’ coach Bruce Cassidy puts on the ice and can put the players he wants against the players Cassidy ices. Specifically, and this will be my point later in this post, this last change gives Babcock the ability to match his top line against the Bruins’ top line. And, from what I’m seeing, that matchup is having a huge impact on the outcome of the games in this series. 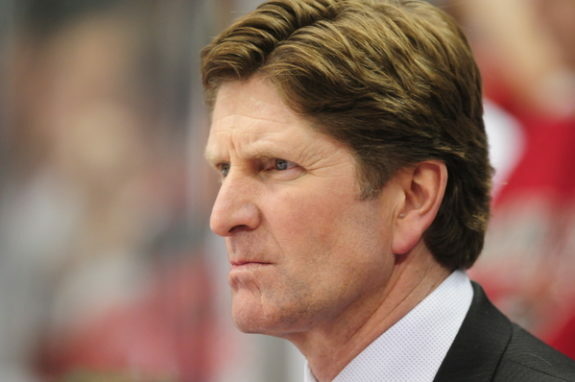 Obviously, I have no true insight into what Babcock is thinking. But, let me theorize for a minute based upon what I am seeing and what’s happening on the ice. First, let’s assume that Babcock is a good coach. That is, he’s smart and strategic; and, as a coach, he’s studied the rosters, both of his team and of his opponent’s team. Then, based upon that study, he’s formulated a plan he believes gives his team the best chance to beat the Bruins. What’s that plan? So far, this is what I have seen. I’m throwing out Game 2, because the Maple Leafs blinked and became reactive rather than proactive. They lost their composure, forgot their gameplan, and got demolished. But in Games 1 and 3, the reasons why the Maple Leafs won were quite similar. In both games, their top line of Zach Hyman, John Tavares, and Mitch Marner outplayed the Bruins’ top line of Brad Marchand, Patrice Bergeron, and David Pastrnak. By the way, Hyman, Tavares, and Marner didn’t do it by themselves. The defensive pairing of Jake Muzzin and Nikita Zaitsev made it a five-on-three matchup. In the games the Maple Leafs have won, this group of five has either outplayed the Bruins’ dominant top line or has negated this line’s effectiveness. That’s why I think the Maple Leafs have won. Here’s what I think Babcock is thinking. He believes that, if he can negate the Marchand, Bergeron, and Pastrnak line, he has more horses than the Bruins have. The Maple Leafs don’t even have to win the battle of the first lines, they simply have to tie (negate) it. And, that’s the difference. The Bruins’ top line has to win; the Maple Leafs’ top line only has to tie. Because, take Marchand, Bergeron, and Pastrnak away from the Bruins’ lineup, and that leaves you David Krejci (20 goals in the regular season), Jake DeBrusk (27 goals), Danton Heinen (11 goals), and Chris Wagner (12 goals). Those are the only Bruins with double-digit goals. In addition, if you can neutralize the Bruins’ first line, the rest of the Maple Leaf players are far speedier and far more skilled than the remainder of the Bruins’ players. Because, Campbell knows that the Bruins’ top line has carried most of the offense the team has generated all season. Campbell added, “The Bruins also need more urgency and production from their top line of Patrice Bergeron between Brad Marchand and David Pastrnak, which has had one good game of three in the series so far. Just ask the Tampa Bay Lightning how successful a team can be when its stars go dry.” And, the Lightning were a deep team. The Bruins are not. The Maple Leafs can win this series if they tie or win the battle of the first lines, then use the speed and quickness from the rest of the team to make the Bruins chase them. In Game 1, the Bruins fell victim to the overwhelming speed of the Maple Leafs. They couldn’t defend that stretch pass, and coach Cassidy should have seen that coming. Other teams watched the video and had started to better defend the Maple Leafs’ stretch passes. Why weren’t the Bruins in the film room? That wasn’t smart. In the Game 3 win, I think the Maple Leafs stuck to the gameplan and nickeled and dimed the Bruins for the win. 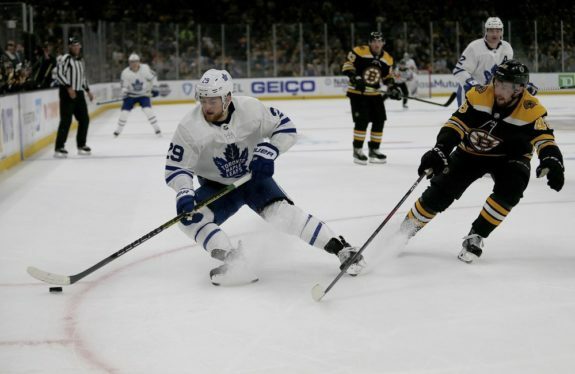 The Maple Leafs’ quickness all over the ice exposed the Bruins to mistakes in the same way the Bruins’ overwhelming physicality had exposed the Maple Leafs to mistakes in Game 2. In this series, the tide shifted in Game 1 when the Maple Leafs stole one. It shifted again in Game 2 when the Bruins beat down the Maple Leafs physically and mentally. In Game 3, there was not much of a tide. Instead, the Maple Leafs’ speed and quickness left the Bruins chasing. Certainly, the Bruins will come out hard in Game 4. 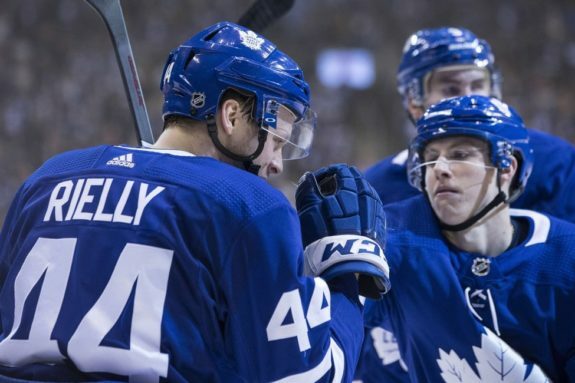 But, if the Maple Leafs keep their cool – both mentally and physically – without getting suckered into retaliation and macho competition, they are the speedier and more skilled team. They have the most stars and the best offense. And, by the way, they also have Frederik Andersen in net. Somehow, I forgot to mention him in this post. He helps, too.